Performed by Mario Hossen, violin Accompaniment: Plovdiv Chamber Orchestra Conductor: Nayden Todorov Mozart's third violin concerto, KV216, sometimes called the 'Strassburg' for a 'Strassburger' tune in its Rondo, is scored for a rather simple, chamber-sized orchestra. The Adagio of this concerto must be the most sublime movement in any of his violin concerti and one of the most beautiful and quintessentially Mozartian in his entire oeuvre. 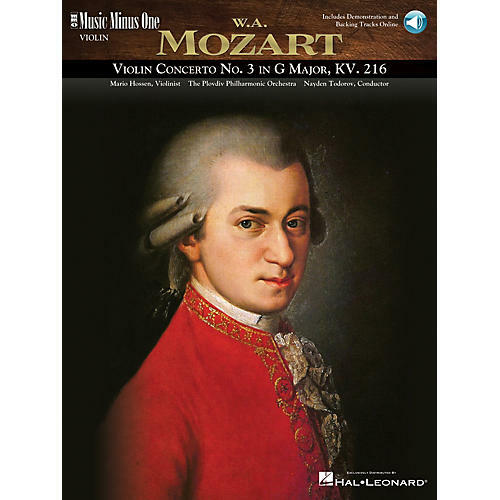 Perhaps the most memorable of his five violin concerti, it is quintessential Mozart and an indispensable addition to any serious violinist's repertoire. Includes a printed music score with informative liner note, and demonstration and backing tracks line. The audio is accessed online using the unique code inside each book and can be streamed or downloaded. The audio files include PLAYBACK+, a multi-functional audio player that allows you to slow down audio without changing pitch, set loop points, change keys, and pan left or right.